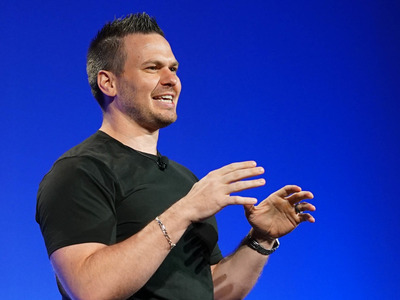 Business cards are an afterthought for many people, but for entrepreneur John Ruhlin, they’re a great way to make a good first impression. Ruhlin spends $US3 on business cards and $US9 on company letterheads that are made out of solid aluminium and engraved with his contact information. He says it’s smart to invest in things that will generate interest in your company and have a high chance of being shared among clients and potential customers. For John Ruhlin, it’s $US3. At least that’s how much he pays for each one of his business cards, which are square and made of solid aluminium. When done well, Ruhlin wrote in his 2016 book “Giftology,” a business card can spark conversations that wouldn’t have happened otherwise. “He slowly looked down at the card, up at me, down at the card, and up again, before exclaiming, ‘This is the coolest fricken card [except, he didn’t say fricken] I’ve ever seen! What do you do again?” Ruhlin recalled. Ruhlin said he gets plenty of criticism for shelling out so much on business cards. No manufacturer he contacted had ever created such an expensive card, he said. But he didn’t go broke from making the cards – in fact, business went up after he started handing them out. For Ruhlin, it’s all about keeping his company at the top of his potential clients’ minds. Mark Abadi/Business InsiderAn engraved, aluminium letterhead from the Ruhlin Group. 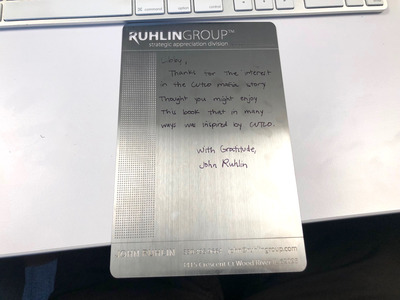 Ruhlin uses the same logic to justify his company’s letterheads, which, like his business cards, are a solid sheet of aluminium engraved with his company’s information. Those cost $US9 a pop, Ruhlin says. His company hand writes messages on them in Sharpie.